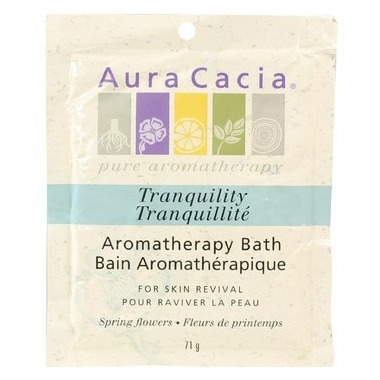 Create an at-home spa treatment with Aura Cacia's Mineral Bath! It ensualizes the senses, relaxes the body, and calms the spirit. Emerge from the soothing waters of your tub refreshed and velvety smooth. Ingredients: Sodium Borate, Sodium Chloride, Sodium Bicarbonate, Lavandula Angustifolia (Lavender) Oil, Abies Balsamea (Balsam Fir) Needle Oil, Pogostemon Cablin (Patchouli) Oil, Cymbopogon Martinii (Palmarosa) Oil, Pelargonium Graveolens (Geranium) Oil, Chamaemelum Nobile (Roman Chamomile) Oil.